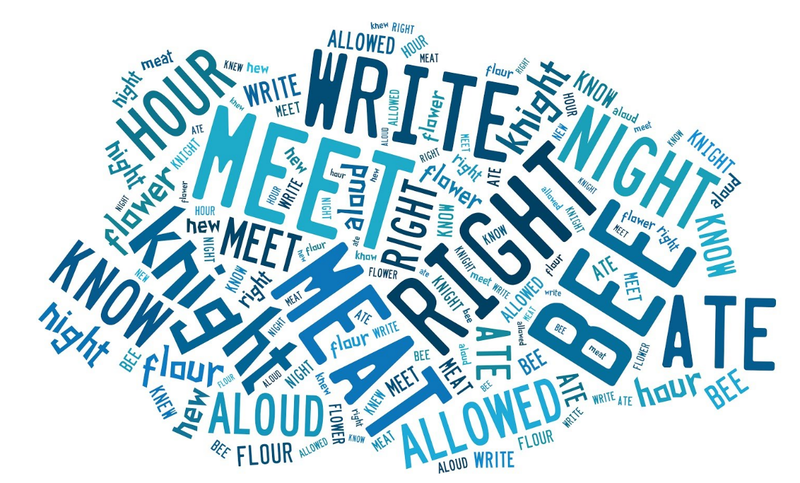 Have you heard these words- ad, add; bare, bear; been, bean and got confused with the spellings? These words are pronounced in a similar way but are spelled differently and mean different. These words are known as homophones. There are some more examples of homophones. So, let us have a look at some more interesting homophones. Allowed means when you get a permission from someone to do something. Example: - My mom allowed me to go to Preeti’s birthday party. Aloud means with use of voice, orally. Example:- The teacher told Sneha to read the sentence aloud so that the whole class could hear her. Dear is used when you greet someone with affection and regards. Example: – Dear, can you please come here? Deer is a herbivorous animal with horns. Example: - I saw a deer walking near the forest. Meet means to see and talk with someone. Example: - We couldn’t meet today because of an urgent work. Meat is the flesh of an animal. Example: - She is a pure vegetarian. She does not like meat at all. Born means to be brought into the world. Example: - Reena’s baby was born at 12 am. Borne means carried or sustained. Example: - Nowadays waterborne and airborne diseases are increasing dramatically. None means not at all. Example: - None of her friends came for the party yesterday. Nun means a woman who changes her religion and now looks after the church. Example: - She decided that she would become a nun. One is used as a single unit or thing which is not more than one - two or three. Example: - I am full, please don’t give me more than one spoon of rice. Won means to win or victory. Example: - India won the World Cup yesterday. Hair is the thin thread-like strand grown out of the human’s or animal’s body. Example: - I just love her hair. Her hair is so long. Hare is an animal which is similar to a rabbit. Example: - Today, I saw a hare in the zoo. There are many homophones which create confusion. Few amongst them are listed above. Try to understand their meaning and use them while speaking or writing to improve your English-speaking skills. You can also join an online Spoken English program to learn in detail. 5. How to Overcome Hesitation While Speaking English?